How long have you been making puppets? 34 years. I loved puppets when I was a kid, and apprenticed starting in 1980 with a French company, Le Marmoset, a husband-and-wife team. I was kind of like their adopted son. I learned more in those few years than I possibly could have in any other situation. 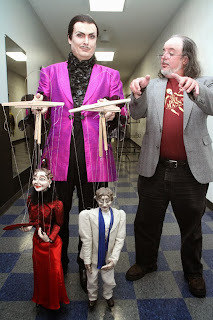 Did you learn about marionettes with them? They worked mostly with hand-puppets. One of my jobs was to adapt their scripts, because they performed with thick French accents and we could turn that to our advantage. For instance, one time we were doing an undersea show, about penguins, and he would say, “ze Souse Pole.” So for the set, I painted a sign with that spelling: “Souse Pole”—and when the curtain went up for that scene, we would get a laugh. 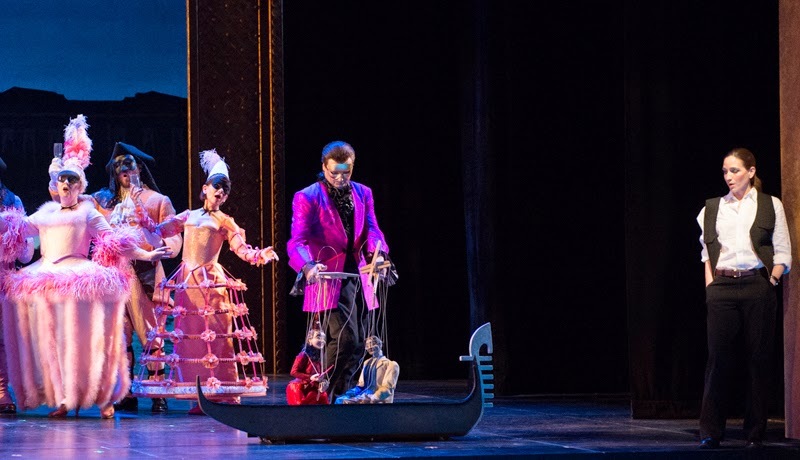 Have you been involved with operas other than The Tales of Hoffmann? No, although I’ve worked with ballet—created masks for The Nutcracker (another Hoffmann story!). Ten years ago, when this Tales of Hoffmann was first created, Seattle Opera was calling around to various local puppeters, and Dimitri Carter of Carter Family Marionettes recommended me. I think what really sealed the deal was that when Chris Alexander, the director of Hoffmann, was talking about all the things he wanted the puppets to do—drop her fan, dab at her eyes with a handkerchief, gesture with a mirror, paddle a miniature gondola—I was brutally honest and told him, “Let’s be realistic, you’re asking an opera singer, who is not trained as a puppeteer, to operate two marionettes, one in either hand; you may need to scale back our expectation of what’s possible.” I think he appreciated my honesty! 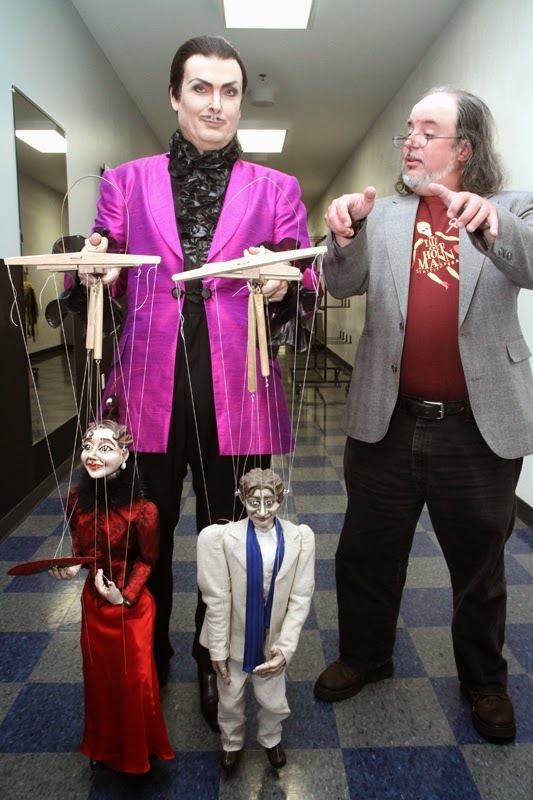 How hard is it to teach a non-puppeter to operate a marionette? So most marionettes don’t have the little thumb-operated controls for the legs? That’s a “Pepito Control,” to operate the legs with just a rocking movement of the thumb; that was designed by Jim Rose, probably 25 or 30 years ago. (His mother and father designed Howdy Doody, for you puppet fans!) Our puppets also have extender-bars, to make the arms go further, because they are tall puppets with short strings. And at the back, instead of a string it’s got a piano-wire rod, inspired by Czech marionette design. Czech puppets have these rods that go through the head, to keep things from getting tangled. I combined lots of design-ideas in the hopes of making something very simple to operate, as we didn’t have a lot of time. Geoff Alm, Seattle Opera’s fight choreographer, had about an hour to stage the big sword fight in Act Three, and I had an hour with each of the two singers, Nicolas and Alfred Walker, and then a stray minute or two here or there in rehearsal. I didn’t have any time to work with them in terms of getting into the gondola. That’s tricky; it has to look like the puppet is stepping into the gondola. The puppets can’t suddenly levitate and float into the gondolas...that destroys the illusion! I’d like to go back to what you were saying about Czech puppet design. It’s an amazing industry. 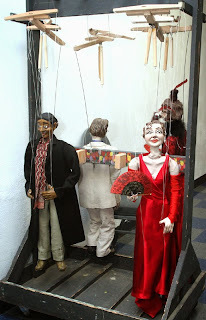 If you’re on the streets of Prague, or any big city, there are street vendors who sell thousands of these amazing marionettes, made in big factories. With a looped piece of wire, a little wooden dowel, a cross-T, and a couple of strings you get amazing control on a small marionette. 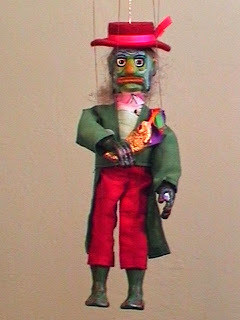 I have a little Czech puppet of Vodnìk, a popular character from Czech folklore and the beautiful Dvořák opera Rusalka...part of that central European opera/puppet connection. 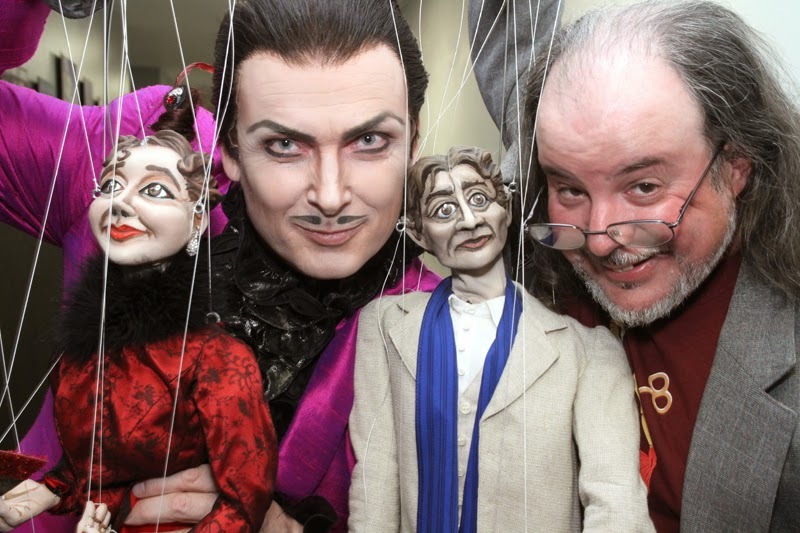 Opera and puppetry go very well together; both forms are so over-the-top! Neither one is limited by the needs of realism. And there are so many cultural connections; every culture has its own style of puppetry. It’s an international form with specific national schools, just like opera. In Sicily, for instance, they use these large marionettes, 4 or 5 feet tall, with metal armor, weighing 80 pounds, and perform a cycle of stories based on Orlando Furioso. An epic poem which also inspired huge numbers of operas. 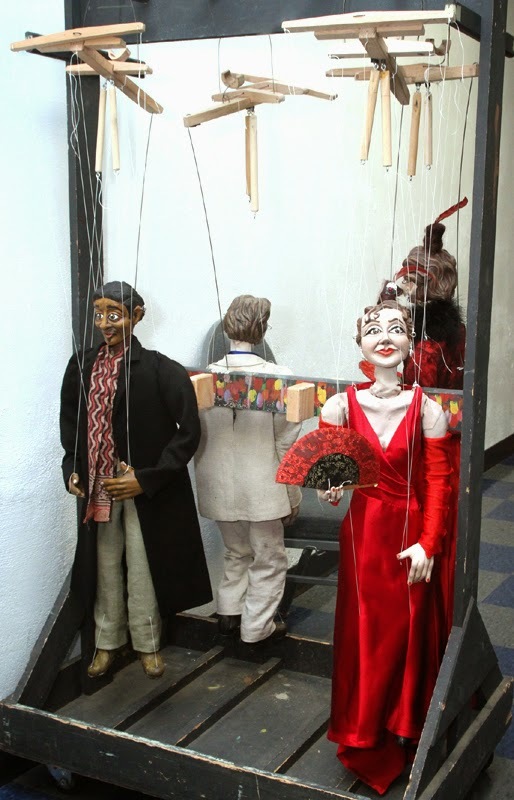 Yes, at Northwest Puppet Center, where they do an opera every year, they tell me there are a number of operas that were composed specifically for marionettes. You can find me most weekends down at Pike Place Market, here at “Planet of the Puppets” (or like our Facebook page). And I take a lot of private commissions. It’s lots of fun to come up with something that’s never been done before. And I’m always willing to be honest about what’s possible! Yes, and we also sell kits, to make a dozen Pop-Up Puppets at home, at a party, or perhaps a business retreat. With these, we’ve done most of the work already, and all that’s left is the creativity. In fact that’s the part most adults are a bit nervous about! But people have had a lot of fun, doing self-portraits, or glueing little print-outs of photos of themselves and their friends to the tops of these puppets. It’s a lot of fun! 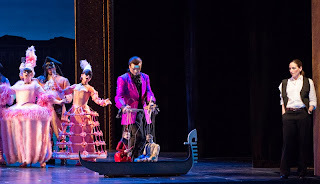 This may be a dumb question...but what’s your favorite part of The Tales of Hoffmann? You’d think it would be the puppets in the Giulietta scene. But surprisingly, I love the Olympia scene! I love automata, I know a bit about their history, and the fact that she’s singing this incredibly complicated piece, and acting it out physically, and malfunctioning—I love that. And the fact that he falls in love with something that isn’t real. That’s my business—making people fall in love with things that aren’t real!